[134 Pages Report] The torque vectoring market for automotive is primarily driven by the increased demand for luxury and performance vehicles (including SUVs, crossovers, and off-highway vehicles). The torque vectoring market for automotive is projected to grow at a CAGR of 20.01% from 2018 to 2025. From a market size of USD 5.22 billion in 2018, it is projected to reach a market size of USD 18.70 billion by 2025. The base year considered for the study is 2017 and the forecast period considered for the study is from 2018 to 2025. The objective is to define, describe, and forecast the toque vectoring system market for automotive based on vehicle type (Passenger Cars and Light Commercial Vehicle), Technology (Active Torque Vectoring System and Passive Torque Vectoring System), Propulsion (AWD/4WD, Front Wheel Drive, Rear Wheel Drive), EV Type (Battery Electric Vehicle and Hybrid Electric Vehicle), Clutch Actuation Type (Hydraulic and Electronic) and Region (Asia Pacific, Europe, North America. The research methodology used in the report involves various secondary sources such as Marklines, European Automobile Manufacturers Association (ACEA), Automotive Maintenance and Repair Association (AMRA), and paid databases and directories. The market numbers are based on country-wise production, which is further added to arrive at the regional market. The regional data is then added to derive the global data. Vehicle production numbers have been considered to arrive at the market size, in terms of volume. The country-wise market volume is then multiplied with the country-wise average OE price of torque vectoring system. This gives the country-wise market size for torque vectoring system, in terms of value. The summation of the country-wise and regional-level market size, in terms of value, provides the torque vectoring system market for automotive. The major players in the torque vectoring market for automotive are GKN (UK), American Axle (US), Dana (US), BorgWarner (US), Eaton (Ireland), ZF (Germany), JTEKT (Japan), Getrag (Canada), Bosch (Germany), Univance (Germany), Schaeffler (Germany), Timken (US), Ricardo (UK), and Oerlikon Graziano (Italy). The torque vectoring market for automotive is primarily driven by the increased demand for luxury and performance vehicles (including SUVs, crossovers, and off-highway vehicles). The torque vectoring market for automotive is projected to grow at a CAGR of 20.01% from 2018 to 2025. From a market size of USD 5.22 billion in 2018, it is projected to reach a market size of USD 18.70 billion by 2025. The important factors driving the growth of this market include the increase in awareness about enhanced safety and vehicle dynamics. 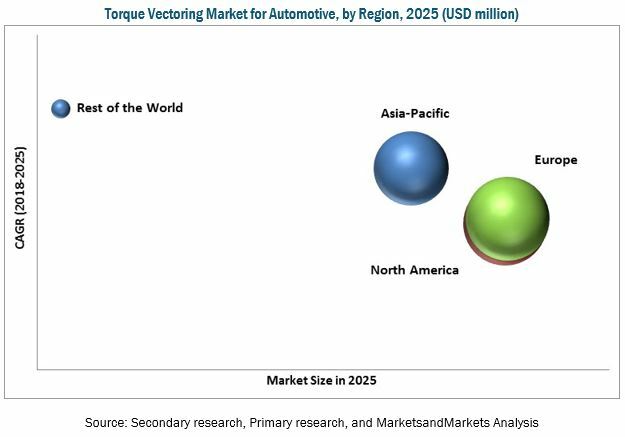 The torque vectoring market for automotive has been segmented on the basis of vehicle type, technology, propulsion, EV type, clutch actuation type, and region. Europe region is projected to be the largest market in the torque vectoring market for automotive because of the presence of many developed countries such as Germany, the UK, France, and Spain, which account for a considerable share of the European automotive industry. The market is dominated by established OEMs such as BMW AG (Germany), Daimler AG (Germany), Fiat (Italy), PSA/Peugeot-Citroen (France), Jaguar Land Rover (UK) and the Volkswagen Group (Germany). AWD/4WD is estimated to be the largest as well as the fastest growing segment of the torque vectoring market during the forecast period. The AWD/4WD segment is mainly driven by growing demand for SUVs, increasing demand for improved vehicle safety, stability, and enhanced driving dynamics. The AWD/4WD systems find their application mostly in the premium car segment and SUVs. Improving economic conditions, increasing industrialization, and the improving living standards of consumers around the world have increased the demand for premium segment cars and SUVs. The electronic clutch actuation type is enjoying greater adoption rate owing to its better efficiency, unlike the hydraulic clutch. The electronic clutch serves the requirements of the mechanical components with more efficiency and durability. Also, it helps in improving the overall fuel efficiency with high accuracy and hence, fulfills several stringent emission norms that is the major factor leading toward the adoption of such components in vehicles. In the electric vehicle segment, HEVs have the largest market share in terms of volume. HEVs are premium vehicles in terms of their price range and the features offered, and they have higher fuel economy compared to the ICE variant of the same model. Japan is the leading country in terms of sales of hybrid vehicles owing to the presence of leading hybrid vehicle manufacturers such as Nissan and Toyota. The growing mobility services is the major restraint for the torque vectoring market for automotive. The development in infrastructure and IT is enabling more connectivity services, which is leading to more pooling services with the help of apps or remote services. Also, due to the emergence of such services and advancements in technology, the technologies in the vehicles are getting over the air updates which is driving the global mobility services market. This increase in shared mobility services would impact the car-ownership model because as the time passes, people would prefer more convenient and affordable transport options. Hence, we expect that as the car ownership is expected to decline with the emergence of shared services, it would hinder the growth of the global SUV market, and therefore restrain the growth of torque vectoring market. The major players in the torque vectoring market for automotive are GKN (UK), American Axle (US), Dana (US), BorgWarner (US), Eaton (Ireland), ZF (Germany), JTEKT (Japan), Magna (Canada), Bosch (Germany), Univance (Germany), Schaeffler (Germany), Timken (US), Ricardo (UK), and Oerlikon Graziano (Italy). Currently, GKN, Dana, BorgWarner, and ZF are the dominant players in the torque vectoring market for automotive. The extensive competition in the automotive industry has led these companies to primarily focus on innovations. Mobility is becoming increasingly advanced and automated and requires a highly complex technology. Therefore, companies must focus on innovation. *Details On Business Overview, Products Offerings, Recent Developments, SWOT Analysis, MnM View Might Not Be Captured In Case Of Unlisted Companies.